Step 2 in preventing pollution is education. Education has the potential to be one of the most far-reaching tools available. We take what we know from our research and we talk about it. Yes, it really can be that simple. Our programs are ever-expanding. 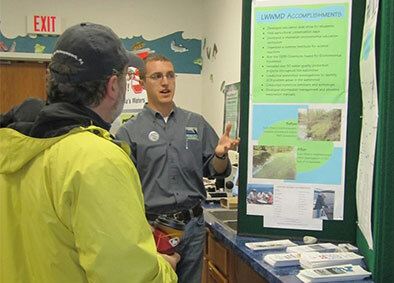 Educational programs include general information on watershed management. Many people have never heard of watershed management. Those who have heard of it often experience difficulty trying to define it. We give educational presentations to our local community associations, realtor’s groups, civic organizations, and countless other groups of people to make sure they know what we do. Other educational efforts are aimed at reducing the amount of fertilizers, pesticides, and chemicals people use at their homes. We also try to encourage the installation of rain gardens, rain barrels, and other tools that help to control stormwater. As the threat of invasive species increases, we do our best to ensure boaters, fishermen, and visitors have the knowledge to prevent spreading these species. We’ve produced brochures and boat ramp signs to spread the word about invasive species. We lead educational hikes, paddles, and sampling events, reaching thousands of people every year and providing education and advice on stopping pollution before it starts. We spend over two weeks a year with our local school, providing programming and place-based education. LWWMD and the Wallenpaupack Area School District created an award winning science curriculum for the students of Wallenpaupack High School. The week-long program takes the students on a mix of classroom and field trip lessons related to all aspects of watershed management. They visit wetlands, sample streams for insect life, perform lake sampling, hear from numerous resource management professionals, and tour several projects completed by the Watershed District highlighting the benefits of Best Management Practices, or “BMP’s”. We visit our local 4th grades for Earth Day each year and promote the benefits of wetlands. By educating our young people, we hope to have an entire generation of environmentally conscious residents and visitors to help us in future endeavors to protect the lake. In addition to our young people and community members, we also try to work hand in hand with our municipal officials and county conservation districts to ensure that regulations and zoning help control pollution problems or prevent them before they start. Education is a big part of our daily operation and one of the most effective management tools we can promote. Unfortunately it cannot fix the pollution that already exists. What education cannot fix must be fixed with other management tools.